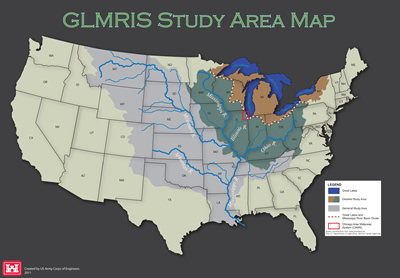 The Great Lakes and Mississippi River Interbasin Study (GLMRIS) is a U.S. Army Corps of Engineers study that presents a range of options and technologies to prevent aquatic nuisance species (ANS) movement between the Great Lakes and Mississippi River basins through aquatic connections. See the map below to view the location of these basins and the GLMRIS study area. Through a structured study process, USACE identified ANS of Concern established in one basin with the risk for transfer to the other, analyzed and evaluated available controls, and formulated alternatives with the goal of preventing ANS transfer between the two basins, specifically within the Chicago Area Waterway System.